Diceroprocta cinctifera is found in North America, specifically the south-western United States and Mexico. There are three subspecies. It was formerly known as Cicada cinctifera. Yes, its name has changed. 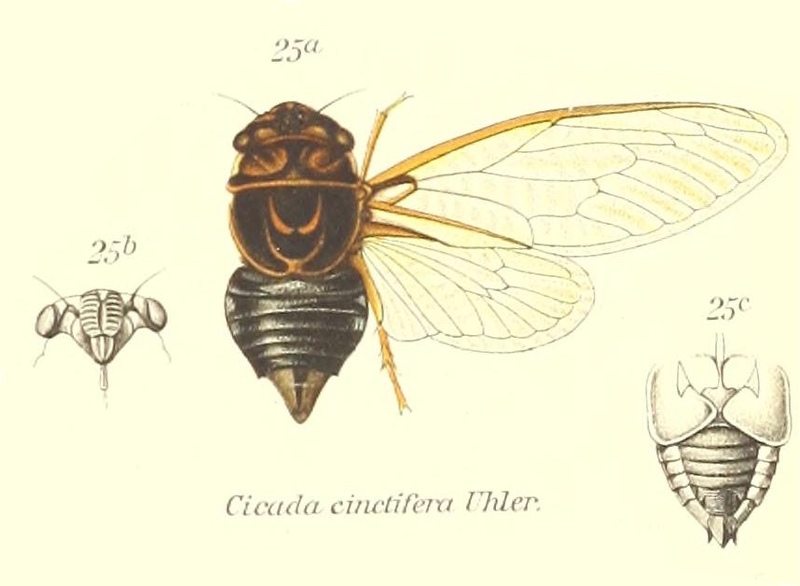 The image says Cicada cinctifera, but the name of this cicada is Diceroprocta cinctifera. 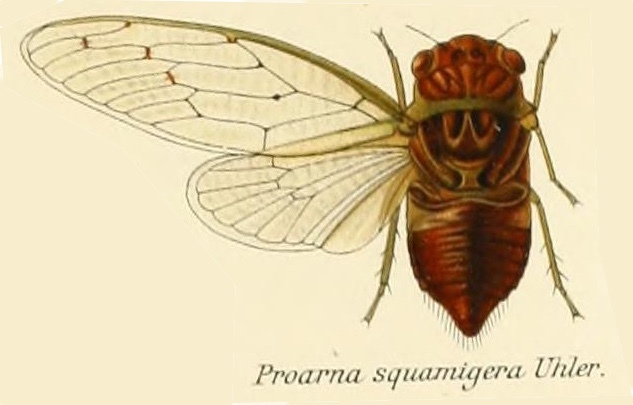 Proarna squamigera Uhler, 1895 is found in the Antilles islands. Characters. — Head (including eyes) about equal in width to base of mesonotum. eyes scarcely projecting beyond anterior angles of pronotum, vertex of head at area of ocelli distinctly longer than front; pronotum a little shorter than mesonotum. the posterior angles a little prominent but not lobately produced; abdomen about as long as space between apex of head and base of cruciform elevation; metasternum with a moderately elevated transverse central plate, which is not anteriorly angularly produced ; tegmina about three times as long as broad, the transverse vein at base of second apical area more or less vertical ; wings about half the length of tegmina, the latter with eight apical areas, the basal cell longer than broad.